The Jeju Summer Classic, one of the showpiece tournaments of Jeju-based hockey team "Jeju Islanders," was played at the beginning June. This tournament saw the Jungmun Jets come away 3-1 winners in the final against the Pyoseon Penguins. June's tournament was the seventh held by the club since the Jeju Islanders first came into existence back in 2013. The team’s founder, Dave Cunning recalls how the team only had a few players with a handful of equipment in the beginning. “It was a fresh option for everyone, and excitement and enthusiasm for hockey grew quickly,” he explained. As more and more players joined the team, the Islanders began receiving major equipment donations and eventually started participating in tournaments up in Seoul. And, how far the team has come since then. 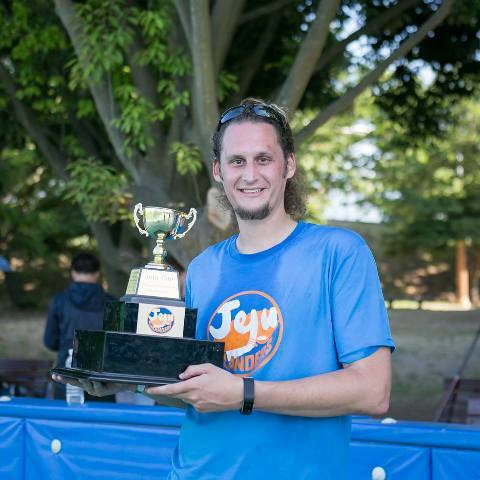 The latest installment of the Summer Classic was the second consecutive victory for the Jets, and third overall, making it the most successful team in the history of the competition. The tournament featured only four teams this time around, but a new team, the Gimnyeoung Maple Leafs made its debut. 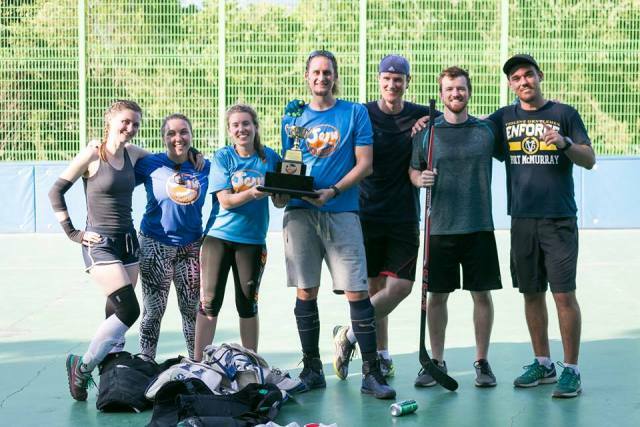 The tournament was also the final swan song for players Jamie House and Christopher Corby, as well as Angela DeLuigi, who won the 2015 Winter Classic as a member of the Soesokkak Oilers. The year 2017 also saw the departure of a team legend, Jaesuk Hwang, who was beloved by all because of his tenacity on the rink and enormous heart. According to Allan Moore, who manages team operations, it was a throwback to the old days with the smaller number of teams, but some new players played in the Classic for the first time as well. The Jets’ victory was especially meaningful for Ty Riddick, who won his second consecutive tournament, joining Moore, Chris Salzwedel, John Schmale, Kendra Song, Ryan Brown, and Song Jeong-moon as the only players to win the trophy on multiple occasions. It also marked the first tournament victory for the rest of the Jets, including captain Eric Hevesy, Amy Nichole, Catrina McBeath, Dani Leon, Cole Ulbricht, and Dave Gagnier. Hevesy, in particular, was elated to finally lift the trophy. “I’ve been with the Islanders since the beginning, and I’ve played in five or six tournaments, so it was special to win it, especially with other players like Amy and Cat who have been playing for a long time. Of course, coming back from 1-0 at half to win 3-1 made it that much more memorable and exciting to finally lift the cup,” he said. But, hockey has become much more than just a game on the island. Going back to the earliest days, charity and giving back to the community have been a staple principle. “The goal of the first Jeju Cup was to raise 1,000,000 won and buy a set of goalie equipment for the Jeju Inline Academy, which I was helping coach,” Cunning remembers. “Their team had been putting regular players in net for games against teams who had properly dressed goalies up to that point. I saw a need, and thought it was an obtainable goal for the incredibly giving Jeju community to tackle. The charitable spirit of people on the island is unlike anywhere I’ve seen in the world,” he added. That spirit is still strong within the team up to the present day. In more recent times, a core group of players have been involved in the decision making process of where money raised from tournaments is donated, with recipients including children’s orphanages and other community organizations. The growth of the team through the years has had a significant impact on all those who have been and are involved, and people joined for many different reasons. “To some people, the Islanders have been their first chance to be part of a team, and feel the thrill of scoring a goal for the first time. For others, it’s a welcomed re-connection with the game they already know, but thought they were separated from when they left their home country. And, for both, it’s become a place where they feel they can impact the island in a positive way with their support,” Cunning said. Salzwedel, known affectionately as Brother Dude, put it in his own words. Kendra Song, a longtime Islander, took it a step further, equating the experience to being part of a family. “Being an Islander reminds me of my first few years on Jeju, when the non-Korean community was small, warm, and welcoming. You could walk in knowing nothing or nobody, yet leave with new friends, plans for later, and sometimes a new trick or two,” she began. “It is the embodiment of good sportsmanship and a beautiful thing to be a part of, where amazing players share their skills and a game they love with folks who haven’t a clue about it. Being an Islander is the butter knife of hockey/community love jam, spreading it all around,” she finished, in her own unique style. Being a part of the Islanders community has given people a chance to get to know others who they likely never would have had a chance to meet had it not been for the great Canadian game. Whether it’s on Saturdays at the rink, at tournaments, or at local events, the group relishes the opportunity to get together and share good company, while looking to grow the family week by week as new faces come into the fold. To all involved, being an Islander does not require a special skill set. Everyone is welcome, and hockey is a great reason to get out and meet new people. One thing will never change, not for those who are here, or for those who have since moved on - once you are an Islander, you are an Islander for life. 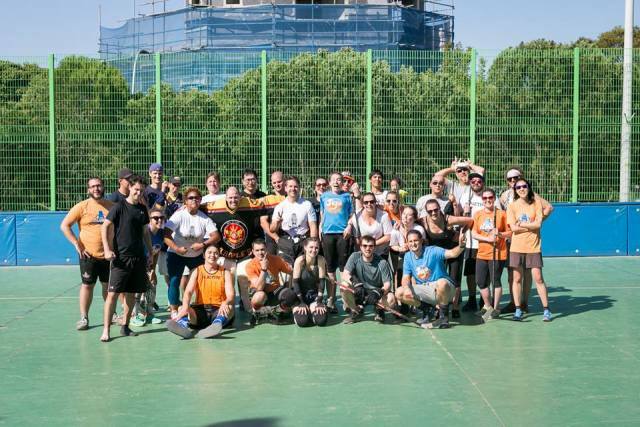 The Jeju Islanders play hockey every Saturday from 5.30 (weather permitting) at the Jeju Inline Hockey rink in the Jeju City Sports Complex. For more info, check out the team's Facebook group here.